After surprising my friend with panoramic rooftop views of Paris on Printemps Beauty and Home's top floor, I had a second little surprise up my sleeve. It was another discovery from my search to find some secret, private (and free!) views of Paris, Brasserie Printemps on the 6th floor of the Printemps Mode building. A perfect place for a break while visiting the 9th arrondissement with many options to choose from. 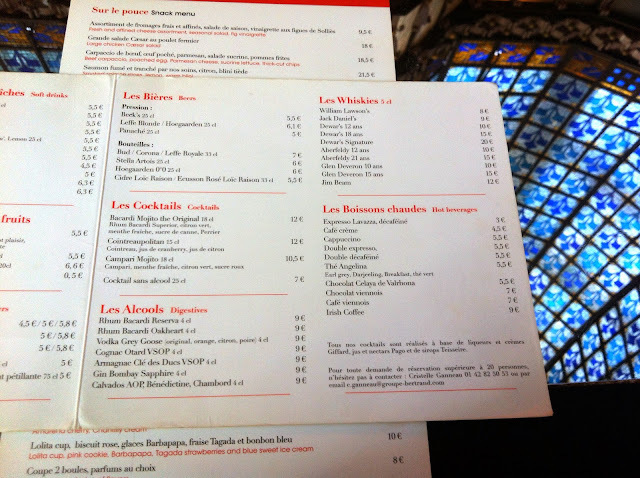 Drinks (alcoholic and non-alcoholic), snacks, entrées, main meals, desserts, there was something for every budget. The prices weren't too outrageous either (hot chocolate at 5.50€, coffee at 3€) considering surroundings like these were included in your purchase. Please note the French are not known for their coffee. I will elaborate in my future post on "How to find decent coffee in Paris". Plenty of seating available, 500 apparently (as they claim) which was good news because we were able to just wander in without reserving in advance. The only drawback were the opening hours. 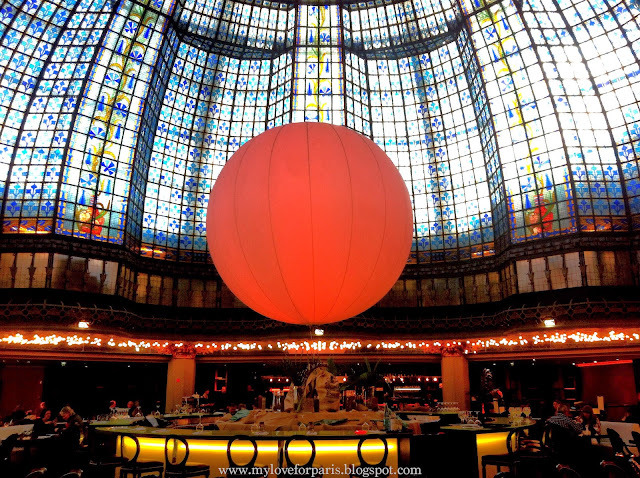 As Brasserie Printemps follows the Printemps department store's trading hours, the brasserie is not available for dinner. What a pity! And so, we ordered our drinks to sip while we did some worthwhile neck straining to gaze at the kaleidoscope of colours up above. 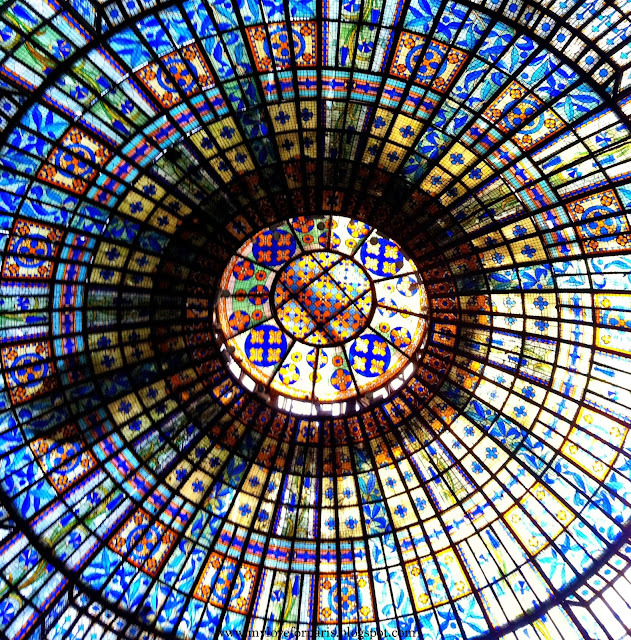 Built in 1923, the cupola is something really spectacular. 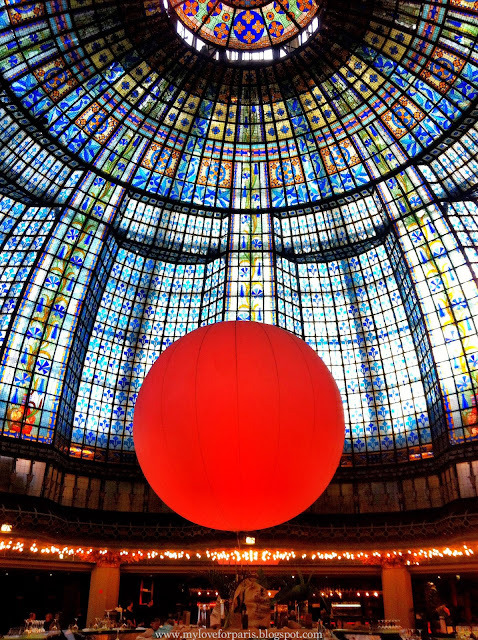 Grab a window seat for views of Paris but grab a seat towards the centre of the brasserie for views of the gorgeous stained glass ceiling. Once seated, you can stare off into the distance admiring the beauty of the cupola and enjoy some comfortable silence with your friend, your partner or sometimes the best company of all, yourself. Its nice to see some of the lessor known places to visit in paris - but just as stunning. Will you please explain which is the beauty building and which is the mode building. If I am on the boulevard facing the store, is one to the left and one to the right? I'm taking people there soon and I want to know what I'm doing! Thanks. Hi Libbie, sure! The Printemps Mode building is the one next to Galeries Lafayette (the one on your left). The Printemps Beauty is the separate building further down. 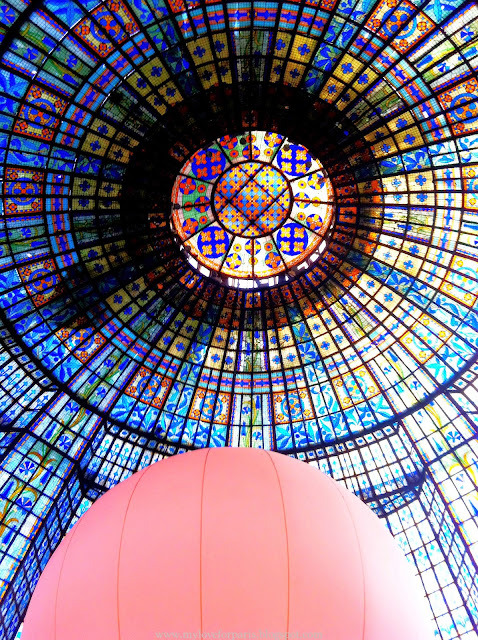 So if you are walking from Galeries Lafayette, the first one you'll see is Mode then the next building down is Beauty. Hope that makes sense, enjoy!